We're all paid up, so I guess we're official now. I'm behind on deer stuff this year, but intend to start soon. I have a good school schedule this year with only 3 classes and the latest ending at 1 pm. Tuesdays I only have 1 class which ends at 9 am, so that is good also. Hopefully I can fare better than previous years and we can give some guys a run for their money! Almost time. I love this time of year, when I can't focus on anything else in life but the approaching deer season. I feel very prepared this year. Ive been working on my spots since early June. New stands, lanes, etc. Bows are tuned and ready to rock. Win or lose, this contest is fun. Looking forward to it. Good luck this year Soybean! I'll be getting a week early head start in Kentucky. Keep in touch this season. You have an open invitation to come down to my club this year. 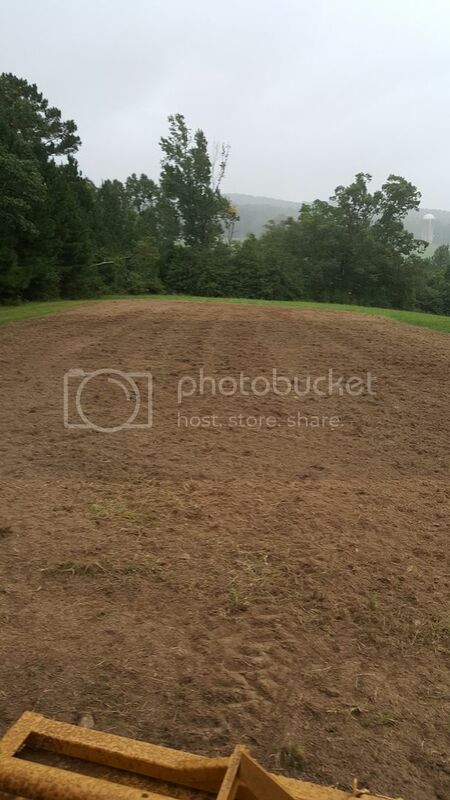 Got one food plot in about 2 hours ago. Right as we finished covering the seed, it began to rain. Hopefully we will have a decent plot by opening weekend. Update: Put one more in at about 2 pm today (8/18). Looking to put at least one more in this week. I'll be with my dad this weekend, so it's another missed opener for me. I also have an 11 page paper due on Tuesday which was originally due next Saturday, so I'll be working my tail off this weekend to get that done. I should be able to get a few hunts in next week, but my English professor is killing me with work . Hope you guys enjoy the opener! Best of luck! plenty of season, school comes first. good luck! kbuck and I will hold it down for a couple days for you. swing and a miss at a doe last night. my arrow hit a limb that i just didnt see. this wsw wind has me staying out of my sets where big boy is at. im waiting on the east wind on monday afternoon for that set. going back to the doe hole this afternoon. maybe my luck will be a little better tonight. we are on the board. the doe hole came through tonight. ill upload pics in the morning. its bedtime. Nice. I'm totally jealous. I'll be lucky to get outside by this weekend. This research paper is whipping my tail and will continue to until Wednesday. Congrats man! Get some good rest! Congrats on the doe soybean. Now lets see some pics of that monsta buck. Glad you're stacking them up, buddy. I should be able to hunt Friday afternoon and Saturday afternoon. I got that 9 page paper completed Tuesday night after a 12 hour typing marathon. Back to my normal schedule and I should get some hunting in. Good luck this week/weekend Soybean, and enjoy the beach, kbuck. Make sure to get some pictures, so you can have the memories forever. Good luck AAP. Im headed back to the bean field this weekend myself. ITS DEER SEASON and Im loving it! On my first hunt of the year. So relieved. A new friend I made in English class let me use his computer to type my paper and while I was over there he invited me to call him whenever I wanted to hunt and we could hunt 1300 acres he has access to about 10 minutes from my place, so we're out here now in the white oaks. Something good did come out of that horrible paper. I'll check back with you guys if I get anything today or tomorrow. Good luck this weekend. Dang. He should definitely be dead with blood like that. That's a huge bummer. I am equally as puzzled as you. That's crazy. If you don't find him, I know it won't hold you down, but it's still no fun regardless. good luck kbuck, id say that deer is going to die. it just depends how far he makes it before he does. get a good dog buddy, good luck. im sure there are others closer to you but nic skinner and his dogs are incredible. ive watched them work, several times. if that deer is dead, his dogs will find it.